Bionic Power, Inc. | Portable Power Takes Some Big Steps Forward! Budget cuts and concerns may be leading to shrinking budgets among some of U.S. DoD’s modernisation programs, but not so regarding small tech that is making a big difference – sensors. Photo: FWS-S, Courtesy PEO Soldier. Of course military sensors are considerably more expensive than their civilian counterparts because of concerns of size, weight and power (SWAP) and the osts of ruggedising. Still, as far as modernisation programmes go, R&D into sensor tech provides a lot more bang for the buck. You may not realize it, but sensors are all around us in everyday civilian life, in everything from our cars to our kitchen appliances, providing data on temperature, humidity, power consumption, fuel economy and the like. Grove went on to say that sensors used by the Army and the Marine Corp are the hardest to develop, because they become an addition to the dismounted soldiers load, and have to survive through mud, sand, wind, rain, extremes of temperature and just about anything the soldier can put it through. Which means the challenge to the PEOs (Program Executive Offices) involved in sensor development and deployment is always one of getting the best, most reliable tech into the hands of soldiers, while keeping SWAP considerations and cost down. 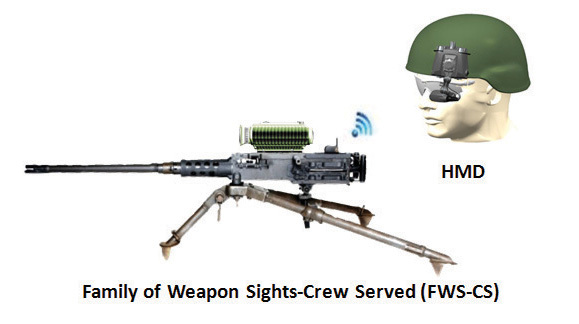 The critical role sensors play in U.S. modernisation efforts, and those challenges were evidenced when PEO Soldier recently hosted industry leaders from 45 companies during an Industry Day for the Family of Weapon Sights-Crew Served (FWS-CS) and Sniper (FWS-S) programmes, conducted by Product Manager Soldier Maneuver Sensors (PM SMS). The Presolicitation Notice for FWS was issued 6 March 2015, Final FWS-CS/S RFPs release expected 1 June 2015, with proposals due 15 July 2015. Anticipated award April 2016.